What Role Do Calories Play in a Keto Diet and Do You Need to Count Calories? You most likely will not have to focus on counting calories. You will typically eat from your allowable foods list until you feel full and satisfied. It’s also a great time to re-learn what eating is all about, and to start basing what, how much and how often you eat on your body’s hunger cues. You will eat when you’re hungry, and you’ll eat until you feel full and satisfied. Eating fats and keeping carbs very low helps your body release fat into the blood stream. This helps you feel more satisfied by what you’re eating, and often, the desire to overeat goes away. 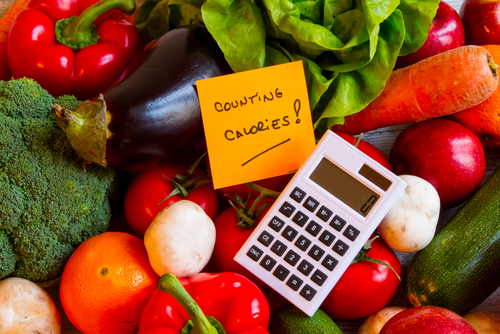 Calorie counting can be done if you are being very strict with your diet, or don’t yet trust your instincts to help you eat only what is needed. Some people just like to start out counting calories (along with the macronutrients) to see how much they’re eating on a daily basis. You don’t necessarily have to have a limit, but this method can give you a good idea of how many calories it takes to keep you feeling good. You may be surprised if you’ve never counted calories before, how many more calories you racked up while consuming a more moderate, or even a high carb, diet. Often, once people get into the swing of things with a ketogenic diet, their overall calorie intake tends to lessen naturally, despite the greater number of high-calorie fat grams being eaten. If you are interested in getting a caloric snapshot of your daily food intake, there are many great online food tracking programs. One with a very large and useful database that you can use is called My Fitness Pal (10). This popular site has helped literally millions of people track their food intake and manage carbohydrates easily. If counting calories is too stressful for you, then, by all means, try dieting by just managing your macronutrients instead of counting calories. Again, you can use an online calculator for this task as well. Yes, it will list the calorie content of the food you’re eating, but all you need to focus on is the number of carbs, fiber, protein and fats in the foods you make part of your keto diet, and don’t worry about the calorie tally. If that is too much work, then again, just be certain not to consume more than 30-50 grams of carbs a day, depending on how strict you are being. Once again, yes, you can use an app like My Fitness Pal (10), Lose It (12) or My Plate (13) to track just your carbs and fiber values. Decide if this method is working for you by tracking your results. If you’re not seeing the results you are looking for, then it may be time to take more of an interest in the macronutrient profile of your diet, and perhaps your calorie counts, as mentioned above. Getting stricter may get you the results you’re looking for. You can, and should, track your results no matter which counting method you’re using to determine daily carb intake. Plan on tracking your progress in multiple ways, and not just depending on the weight that shows on the scale. For one thing, when you are on a very low carb diet, your body will flush out excess water since carbohydrates cause you to retain a great deal of water. You can retain as much as 3-5 grams of water per gram of carbohydrate that you consume. So you can see the correlation between reducing carbohydrates and reducing the water weight your body is holding on to. Many people will have a rather large weight loss when first starting a low carb diet, and this release of carbohydrate-related water retention is the main reason. An added benefit to eating in this manner is that you won’t be including a lot of pre-packaged snacks and junk foods in your diet. Refined carbs, sugary treats, and big starchy meals will be a thing of the past. And, you won’t even miss them! They certainly won’t fit the qualifications for acceptable foods on your diet, and so they will naturally be omitted from your menu. That alone, can negate the need to count calories. You’d be surprised how fast all those cookies, cakes, chips, sodas, desserts, snacks and more can add up to extra calories and extra weight. Typically, after just a week or so on your new ketogenic diet, your tastes will also change. You’ll really begin to enjoy and look forward to the foods on your menu plan, if you didn’t already enjoy them before you started. Before long, you won’t even miss most of the unhealthy foods you used to crave. A little sidebar about exercising while in a ketogenic state … it is true that you can lose weight without exercise when following a keto diet. This is great if you have limiting injuries, or for other health reasons, cannot start an exercise plan. You will be in fat-burning mode 100% of the time, whereas if you were not following a ketogenic diet, your body would be burning carbohydrates for energy and you would have to burn through those energy stores first, before switching over to using body fat for fuel, when exercising. However, that being said, it you want to ramp up your results even more, then exercise is the magic bullet. Another benefit to exercise, if you choose to incorporate some sort of weight training into your routine, is that you will build and maintain your lean muscle. Muscle requires calories to survive, and this means that added muscle will have you burning off even more body fat all day every day. For more information on adding exercise to your diet plan, take a look at the Reset Factor Online Program. You can learn more about the keto diet in general, as well as how to apply a targeted exercise program based on your lifestyle, fitness level, and body fat goals. There is also information here about using the keto diet in a cyclical fashion in order to build even more muscle and shed body fat at the same time. After all this talk about exercise and dieting, are you still craving that sugary dessert? Check out the mouth watering recipes our Reset Factor Chef, Bonnie, has created at Reset Kitchen!